"I already loved you in some vague wherever, and my nostalgia for that love makes everything in my present life a tedium. Perhaps you are just my nostalgia for something, and embodiment of some absence, the presence of some Distance..."
Flour, butter, and sugar - pantry staples that keep me grounded. Unlike thoughts and emotions - they are consistent. Unafraid. Even if dough breaks as it's rolled out, I know it can be patched together or made into something else. (A lot of my tarts began their journey as a pie.) Luckily for my own sanity, this recipe came together beautifully, and as planned. These are not actually Pop Tarts - they do not require toasting or warming and they are a far cry from their store-bought cousins. 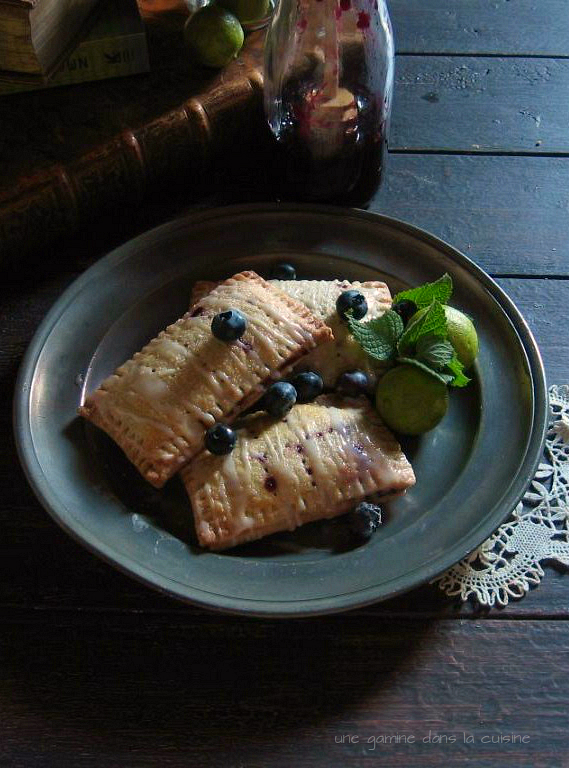 Think of them as rectangular-shaped hand pies. I infused the pastry with fresh mint from my garden and key lime zest, there's also a splash of lime juice in the blueberry filling. I'm quite happy with the results! The mint isn't too loud, but you can definitely tell it's lurking about. Feel free to omit the mint completely if you're not a fan - the blueberry and lime make a symphonic duo on their own. If you're feeling particularly inspired, let your imagination take over - I'm dreaming about strawberries and basil! Prepare the pastry: In a large mixing bowl, combine the sugar, lime zest, and crushed mint. Use your fingers to rub the zest and mint into the sugar until moist and fragrant. Whisk in the flour and salt. Add the cold bits of butter - toss to coat. Prepare the filling: Place the blueberries, lime juice and sugar into a medium-size saucepan. Stirring occasionally, cook over med-low heat until the mixture resembles a thick jam. Remove from the heat: Cool completely before using. Remove one sheet of tarts from the refrigerator. Brush the tops with the beaten egg and use a fork to poke several holes through the top of each tart - sprinkle with a little bit of granulated sugar. Bake for 25-30 minutes or until the tarts are golden brown. Remove from the oven and place the sheets onto a cooling rack. Cool completely before serving. 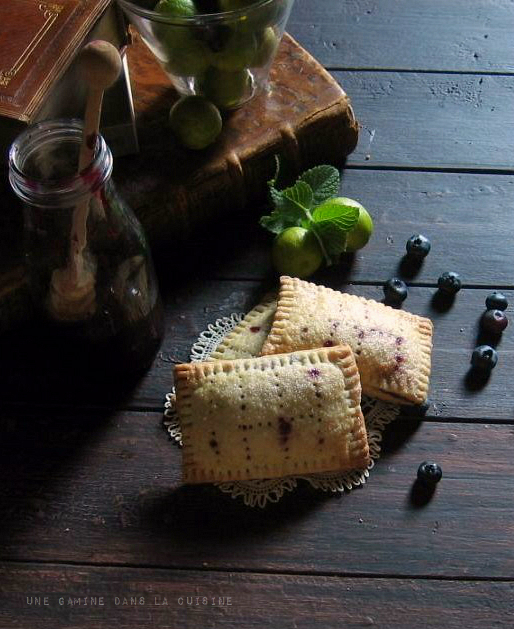 Darling little "pop tarts" - I'm smitten with these flavors! I'm feeling pretty scattered now too, Valerie. It's hard to feel settled when your thoughts are anything but. 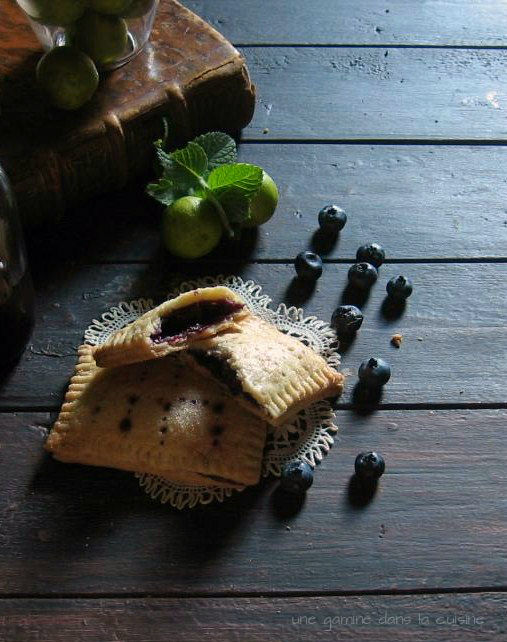 Needless to say, it's hard to believe these tarts were created by anything except the most serene mind. I don't eat a lot of junk food, but pop tarts are one thing I have a weakness for. If I recreated these, I know I'd never long for the store-bought kind again! Valerie, I'm just loving your recipe for these tarts! I just adore blueberries--especially with lemon or lime. LOVE that you used key lime zest in your pastry. Believe me, I am feeling scattered, too. (Even fighting against a copyright violation as a food blogger. Not fun.) Hope you have a great week and it is less scattered, girl! Normally I skip breakfast just b/c I'm not that inspired but these inspire me! 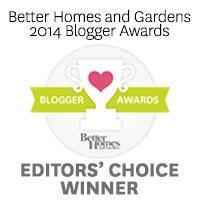 Gorgeous & pinned! Best poptarts I've ever seen! Oh Valerie, you always steal my heart! These are sooo genius! Blueberry and Lime belong together in my book. These don't need to go in the toaster, because they are much better than those kinds. I think you were reading my mind I was going to make pop-tarts the other day, but got distracted by cookies. I have to refocus. Hope you are off to a good start this week. Pretty and divine looking! I bet they taste a billion times better than the store-bought ones. So sweet and charming! Love the addition of lime and mint. Gorgeous. It's hard not to feel scattered this time of year I think, the beginning of a new busy season and the end of a sun filled lazy one. these are amazing pop tarts Valerie! I am incredibly smitten with the flavors - genius!! I love that you added mint. I've always wanted to with blueberry but wasn't sure. Homemade pop tarts are just a million times better than the shop-bought version. 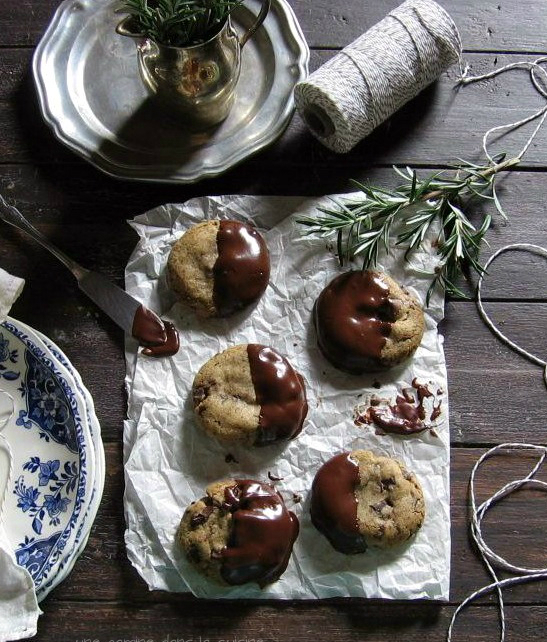 These look truly scrumptious - love them. One thing I have to admit is that I'm not that adventurous when it comes to adding herbs to baked goods. Or flowery ingredients like lavender, or any of that kind of stuff. I'm not opposed, but I just can never quite imagine the flavor. Still, these sound so sophisticated and exquisite, and I'm sure even without the mint, they would be awesome! Sorry for the long absence, but it's nice to come back to this! I need one (or two) of these freshly baked goods! Reminds me of my younger years. Definitely light years better than the store-bought stuff! oh these handpies are adorable! and the pastry is from scratch! impressive. Holy smokes!! These look absolutely terrific! I make homemade "poptarts" all the time, but believe me when I say that they never looked as pretty as yours. Did you find "blue eyes"?! ;-) Hope all is well, sweetheart! Been wanting to take a closer look at these since I saw them on instagram the other morning-wow! Just love this fresh flavor combo. So lovely for the end of summer.